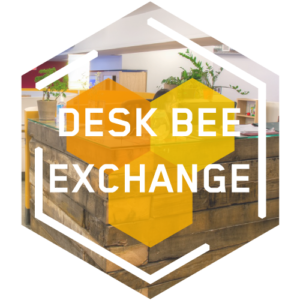 What’s the Desk Bee Exchange Program? A barter opportunity where in exchange for two weekly 4.5 hour shifts as a community animator and receptionist in our social impact co-working space, we’ll give you a HiVE Unlimited package (24/7 access to the space – worth $350/month) and $10 for lunch every week. Right now, we’re looking for someone who is available on Tuesday and Thursday afternoons and who is able to make a 4 month commitment from April 27th to August 28th. We will also be considering applicants for the 2015 DBEP Summer Cohort, which runs from May 25th to August 28th, so please apply even if those weekdays don’t work for you. If you’re interested in this opportunity, please fill out this application form. We will be reviewing applications on a rolling basis until the positions are filled. http://www.hivevancouver.com/wp-content/uploads/2015/03/hive-logo.png 0 0 Melissa Hope http://www.hivevancouver.com/wp-content/uploads/2015/03/hive-logo.png Melissa Hope2015-04-06 09:24:572016-06-08 11:35:12Desk Bee Exchange Program summer applications are open!